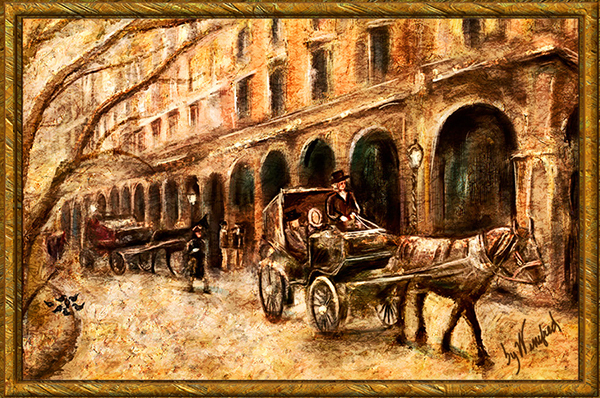 To create this painting I use the architecture from Bologna which I photographed in 2008 and horse and buggy images photographed in New York Central Park in 2012 as reference images. Paying critical attention to perspective this painting was created. Additional characters were included via imagination along with the tree and little birds. In Central Park, pigeons by the dozen hover and feed on the spilled feed of the horses. I really enjoyed using these reference images to create an image with in my mind appears as a scene from the 1800’s. This entry was posted in Winifred Whitfield Workshops and Training by Winifred Whitfield. Bookmark the permalink. it is very nice photography. Thank you very much. It is a digital painting – that is why it looks different. I like the painting quite a lot.